IMAGE: File picture of the Great Western Greenway in Mayo. Transport minister Shane Ross has said that there will be difficult decisions ahead as his department has received 22 applications for a fund of just €53 million over three years. The funding call came at the publication of the Government’s Greenway Strategy. It defines national greenways as off-road routes which are at least 100 kilometres long and a regional greenway is “at least 20 kilometres in length, but preferably closer to 40 kilometres long, or which can be extended to connect to a longer strategic route”. Routes are supposed to follow agreed standards and aim to form part of an strategic greenway network. The national funding is usually complemented by ‘match’ funding of some level by the councils involved. The Galway Cycling Campaign has criticised the Government’s Greenway Strategy as “treating greenway provision as exclusively involving the construction of new roads”. Claiming it is “inherently unlawful” because it does not have a focus on designing “reasonable alternatives” to building new paths, such as “low traffic roads”. The Department of Transport did not reply to requests for comment on the Galway Cycling Campaign position. In the age in which we live there would be likely to be considerable resistance to any effort to curb peoples ability to drive without restrictions. Every boreen in vast tracts of the countryside have multiple houses and it only takes one resident to voice an objection for the whole thing to become nonviable. Surely, it would be worth getting some feedback from visitors and users of this route to give a better indication of whether it is a viable option further afield? I suspect that aka is right any efforts to restrict motorists even on quiet roads will be met with resistance, but one off houses and motorists are not the real impediment to using quiet roads as cycle route. In farming country many of these quiet back roads are transformed into very busy highways when the harvest is on. There is no rush hour, it runs all day and in some cases 24 hours a day. Modern farm machinery is huge, a modern tractor and a twin or triple axle silage trailer is as big as a bus. Imagine an endless string of Dublin buses roaring up and down a boreen at 50 kph all day and you have some idea of the scale of this. Most farmers cut silage twice and sometimes three times a year. After the silage is cut come slurry spreading. If the weather is wet and the soils sticky, the road will be a mess with muck. Farmers don’t like greenways on their land, I suspect they will like this idea even less. Harvest is a time of serious pressure in the farming community, people and machines are being worked hard, there is always the fear of the weather or machines breaking and time is everything. Any proposal that might impeded the harvest will get a very bad reception from farmers. The harvest problem would not exist in areas that have large tracts of marginal agricultural land, like a lot of the west of Ireland. The use of quiet roads might be a good fix for specific local projects. But it fails to confront the real impediment to building a greenway network, the point blank refusal of farmers to accept new greenways on their land. Farmers have reasonable concerns about farms being divided, but these can be addressed by bridges and underpasses. But farmers objections go way beyond this, they have a host of unreasonable objections, that cannot be appeased. The only easy way would be a big pay off. It’s nearly 12 years since Failte Ireland highlighted the potential of cycling tourism as a lucrative market and the need for long distance, good quality off road routes. Then came the GWG, and all the ambitions it stoked, then came plans for national networks, then the farmers objected and that it seems was that. Maybe it time to start a debate about the cost of buying off the farmers. @Kevin with regret you are fundamentally misinformed. The 2007 Failte Ireland strategy was focused on using the large network of minor country lanes not on constructing new roads through farms. The 2007 strategy was endorsed by the 2009 National Cycle Policy framework. If we had followed this strategy we would now have the makings of a national network of routes around the country without alienating farming interests. With regret the main impediment to rural cycling is the unreasonable attitude of people such as yourself who want new roads constructed around the country. Ultimately, Shane makes a reasonably good case for considering using local roads in areas of genuinely low traffic, and clearly that option should be taken into account where possible and should be part of the design options available to greenway planners. However, it is very unlikely to be an acceptable solution in the epicenter of farmers objections to greenways which is the East Galway section of the National East-West greenway. This is good farmland, not marginal land, and it is not particularly sparsely populated. 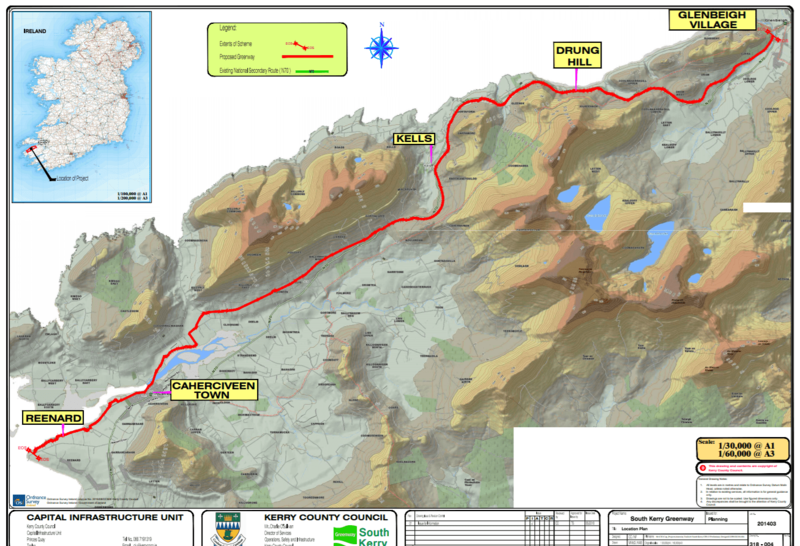 I am not clear whether the ultimate aim of the South Kerry protests is to block the greenway altogether, to have it moved, or to obtain more money for the land, but the general public and local business community in Kerry, by and large, are in favour of continuing with the greenway along the old railway line as planned, so it is really only the landowners holding this back. There is also the fact that the railway line is a continuous route that was once state land. The exact circumstances of how it came to be in the hands of the current landowners is not clear to me, but surely there is some moral imperative to restore it to state ownership for the common good? My argument is not based on the Failte Ireland strategy, which I believe is flawed and lacking in ambition, but on my own reading of the research on which it was based. I believe the key to bringing in big numbers of European cycle tourists is to build a world class greenfield national greenway network. I say this as a lifelong cycle tourist, I’ve done tens of thousands of kms of fully loaded cycle touring in Ireland and about 1500 km in Britain, in the last three decades. People like me in Germany are not going to get excited about the Failte Ireland strategy, even if implemented in full. It would take about 400 hectares of farm land (or the equivalent of 13 average sized farms) to build a 1000 km network, at current prices about 10 million for the land. Farmers objections are irrational, they placidly accept motorways through their land. They are also sociopathic, they object in spite of the economic and social benefits greenways would bring the wider communities in which they live. They moan about lack of investment in rural Ireland yet object to greenways. You seem to think I’m an advocate of road building and an” impediment to rural cycling”, your entitled to your opinion, even though you don’t know me. Just for the record, I’m a non car owning, rural commuter cyclist and public transport user, and as stated earlier a life long cycle tourist. I ride bikes on rural roads for business and pleasure almost every day of the year and have done so for many years. I also worked full time in farming for many years and am still a part time farm worker. I worked three seasons drawing in silage, I’ve driven huge tractors and silage trailers down narrow roads at speed. My doubts about this idea are not based on academic study, but years of experience. I also have close friends who are farmers. This is the viewpoint that shapes my perspective, and even though we disagree on this matter, I assume your views are genuine and sincerely held. I did not dismiss your views as “the unreasonable attitude of people such as yourself” just because I disagree with you. I believe you are wrong, but I’m aware that I might be wrong and am open to changing my mind. Perhaps my worries are irrational and the harvest would pose no problem, or is not as wide spread a problem as I fear, or perhaps the problem could be easily solved, but I would need to hear a credible counter argument to change my mind and you did not even attempt to make one. I advocate for investment in all forms of walking, cycling and public transport and believe every cent invested in roads is wasted. I also believe sustainable transport advocates are crippled by a lack of ambition and a propensity to turn on each other and fight over crumbs. I conceded in my second post that the harvest is not a problem on marginal land and this idea could work in such places. Kerry is for sure an important test case and your right we have yet to see what the objectors real bottom line is. Still not sure if GCC are not distinguishing correctly between a cycling _network_ which could use minor roads and greenways which would’t.